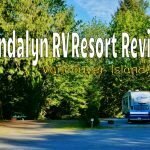 Each year we spend summers mostly stationary on Vancouver Island in beautiful British Columbia. However, once the temps begin to drop in the fall, we become snowbirds and fly south for the winter. The winter half of the year is spent on the road traveling down the west coast and into the sunny US southwestern desert regions. We move around quite often putting a ton of miles on our truck and trailer. 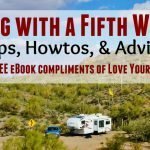 Because of this before we leave on our extended RV journey, I like to make sure the rig is in tip-top shape. Better to have all my maintenance and repairs done now instead of trying to do them while out on the road. This year as I was doing it I thought I do a video for you listing it all. 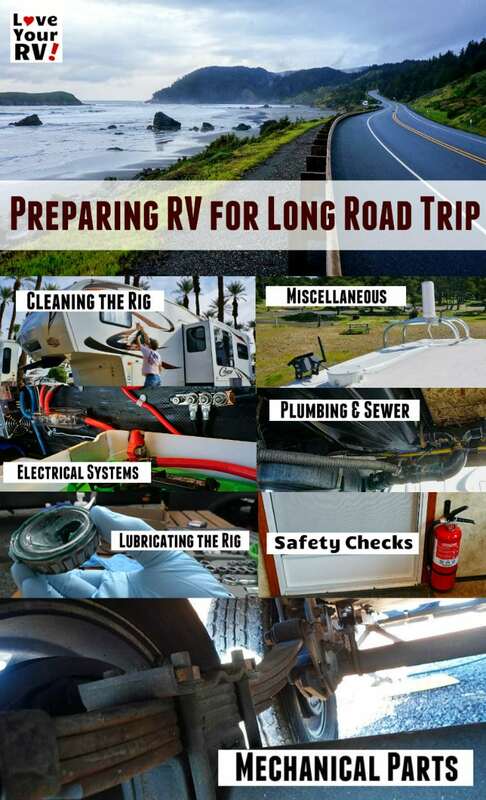 Call it my “Snowbird RV Maintenance Checklist“. 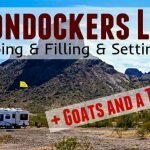 The checklist is mostly focused on a fifth wheel trailer as that’s the type of RV we own but much of it is transferable to a travel trailer, truck camper or Class A, B, C motorhomes. Below the video is a categorized text version with links to products and related posts & videos. I’ve always followed the old saying “An ounce of prevention is worth a pound of cure“. Happy travels! Clean the Rubber Roof – Our trailer roof is an EDPM type synthetic rubber. I use Dawn dish soap and water and scrub the roof with a soft bristle brush and rinse. Any stubborn stains I wipe away with a commercial rubber roof cleaner or acetone. While cleaning I inspect the roof for any defects such as staples, nails or screws popping up. Clear Gutters – While on the roof I inspect the gutter system and clear out any stuck debris. With the hose, I test how well the water is being directed through the gutters and out the spouts. Wash & Wax – Once the roof is all clean, I next wash and wax the rigs fiberglass sidewalls and front cap. 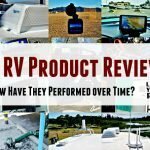 I use a polished called Pro RV, Boat, & Aircraft P-38-Q. It takes a bit of elbow grease but makes for long-lasting protection. I double wax the front cap to help make bug removal a bit easier. I like to use this wax at least once a year and then do one or two touch up jobs using a quick spray on/wipe off wax like Protect-All all surface care. Vacuum the Storage Areas – I unload the storage areas and give them a clean and vacuum and reorganization. It’s an excellent opportunity to remove items we don’t need or use on the road. Wash the Inside Floors, Walls, and Ceiling – Using Pinesol and water in a bucket I wash all the inside flooring, walls and ceilings. It’s a good time to carefully look for any defects or areas that may show signs of a potential water leak. Clean Oven – I clean the RV gas oven with a heavy duty spray on oven cleaner. Wipe off and test operation making sure the pilot light is working correctly and there are no leaks. Windows and Screens – I use Windex on all the windows and wipe out the frames with soap and water. I remove all bug screens including the roof vents and take them outside and hose them off. Clean and Treat the Awning – I use a combo of bleach, dish soap, and water to clean the awning fabric. See this blog post for more in-depth information. I finish the job by applying 303 Aerospace Protectant to help minimize UV damage to the vinyl fabric. Tires and Aluminum Wheels – Tires are thoroughly inspected all around for defects and tread wear. Then I apply 303 Aerospace to them. The wheels are also examined for damage or cracks and then polished. To finish, I check the air valves stems and inflate to the prescribed PSI. Landing Legs – Inspect the condition of the beveled gears on the top of the landing legs and add grease if needed. Every few years I pull the legs and relube. (See this post and video) Check the operation of the gearbox and crossbar. Look for any signs of wear or looseness. Rear Stabilizers – Clean the rear stabilizer jacks and make sure the hardware is tight, no loose nuts or bolts. Apply a dry type lubricant such as Protect-All dry lube to the worm gear and mechanical joints. Entrance Steps – Much the same as the rear stabilizers, clean, dry lube and inspect for wear. Slide Out Rails and Ram – Clean any dirt and debris from the gear teeth. Clean the round slide ram. Lube slide ram with silicone lubricant, spray on and wipe. I also like to add some dry lubricant to the gear teeth and wax the underside of the slide floor. Waste Valve Rods – Since I have installed two new electric waste valves, I’m down to one mechanical type. Spray silicone lubricant on the pull rod and work it in and out to keep the rod from sticking. Door Hinges and Catches – All doors and door hardware get a lube. My new favorite lube is called Lube-All. A good all around lube that repels water and stays in place. Hitch and Pin Box – I use a dry lithium lube for most of the hitch and pin box moving parts. I use a heavy duty grease on the hitch jaws and a plastic lube plate on the kingpin. Awning – Spray silicone lubricant on the moving parts contained in the arm hardware and a shot at each end of the roller. 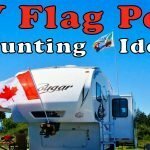 Lube Folding Ladder – I carry a telescopic folding ladder for doing maintenance tasks high up on the RV and other things like supporting my ground solar panel. It needs a couple shots of silicone spare every once in a while to keep the mechanical parts working smoothly. Rear Ladder – Check for cracked plastic end caps and loose screws on each rung. Check the mounting points to the rig and roof. Tighten as needed. 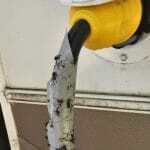 Gas Lines – Inspect the condition of all gas lines and connections. Perform a leak test using my homemade manometer. Check Detectors and Fire Extinguishers – Replace batteries and check expiry dates on the propane and CO detectors and smoke alarms. Service fire extinguishers and replace any that are expired. First Aid Kit – Check items in first aid kits and replace any that have been used or are getting old. We carry a large one and a couple of small ones for our backpacks and the truck cab. Weather Radio – make sure the weather alert radio is in working order and stocked up with fresh batteries. Same with our CB and walkie-talkies. Electric Brakes – Test the brake controller and safety breakaway pinbox cable. Inspect the tow cable plug and the wiring under the rig to each brake assembly. Exterior & Trailer Lights – Check running lights, brake lights and turn signals. Check porch, security and hitch lights. Inspect bulb sockets for corrosion. Interior Lighting – Check and make sure all interior lighting is operational replace any bad bulbs. 12V Batteries – Test each cells specific gravity. Top up cells with distilled water and clean battery connections. Wait a few days then perform a battery bank equalization cycle on a sunny day using the solar controller. Electrical Connections – Check all electrical connections, make sure they are clean, tight and free of any corrosion. Add some dielectric grease if required. Appliances – Make sure all are clean and in good working order. Solar Power System – Check that rooftop solar panel mounts are tight and in good shape, add more Dicor sealant if needed. Test each panel’s output amperage. Confirm proper operation of the solar charge controller. Test the remote ground solar panel. Generator – Clean and test run the portable generator. 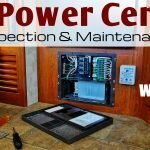 Check output power and perform any maintenance that is due. Heating and Cooling – Check the operation of the Roof air conditioner and RV gas furnace. Check portable space heaters and electric vent fans. 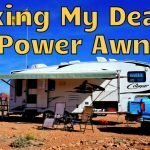 Power Cords – Test main RV power cable, extension cords, adapters and plugs. Carefully inspect their condition. Repair or replace any that show signs of corrosion or overheating. Brakes and Wheel Bearings – Pull the trailer wheels and check the condition of the wheel bearings, hubs, drums, and electric brakes. Replace if needed. Otherwise, clean, adjust and repack with fresh grease. Power Landing Legs – Check operation of the landing legs, gearbox, and motor from fully retracted to fully extended. Relube and replace noisy worn parts if suspect. Check Nut and Bolt Torque – Check for proper torque on all critical nuts and bolts such as wheel lug nuts, suspension U-clamps, hitch, pinbox. Slide Out – Test slide room operation, realign if required. Clean and treat rubber seals and wipers with Protect-All slide rubber treatment. Seals, Vents, and Windows – Check sealant around windows, vents and exterior hardware. Look carefully at all roof and side wall seams. Reseal if needed. Underbelly – Make sure the Coroplast plastic underbelly is in good shape and firmly attached. Look for any missing screws and washers or peeling tape. Bike Rack & Bumper – Inspect bumper for corrosion, sand and repaint if required. Pull out bike rack, lube and check hardware and welds. Water Heater – Remove the anode, drain and flush water heater. If it has lots of hard water mineral deposits, I when fill and rinse again with a 50/50 vinegar and water solution. Check both electric and gas operation. Waste Tanks – Fill and flush all waste tanks several times with clean water. Check plumbing, sewer hoses, valves, and tanks for any leaks. Flush black tank several times with the built-in flushing system and a flushing wand down the toilet. Sanitize Fresh Water Tank – Add a small amount of household bleach (1 cup per 40 gallons) to the tank and run into the water lines. Let sit overnight and flush out the next day. May take a few fills and flushes to remove all the bleach smell. Also, I sanitize my portable drinking water jugs and hoses. Hoses – Check condition of all hoses both water and sewer. Replace or repair any that are worn or leaking. Faucets and Drains – Check toilet flusher and bowl seal. Lubricate the rubber gasket with Lube-All or plumbers grease. Test each tap, faucet, and drain. If required, I clear slow drains and repair leaky faucets. Clean aerator screens on faucets. Clean and lubricate the toilet bowl seal. Water Filter – Install new filters in the dual stage fresh water filter canisters. Check the rubber seals and hardware. Test and check for leaks. Defrost & Clean Fridge – Remove any frost or ice from freezer walls and fridge fins. Check external drain hose making sure it’s in good condition and not plugged. Inspect fridge vent stack and make sure its clear of any obstruction like bird or insect nests, or debris. Test fridge in LP gas mode and inspect burner. If the flame isn’t blue and steady, remove and clean. AC & Furnace Filters – Pull AC and furnace filters. Clean or replace. Plug Mouse and Insect Access – Fill any small gaps and holes with pest rated expanding spray foam. 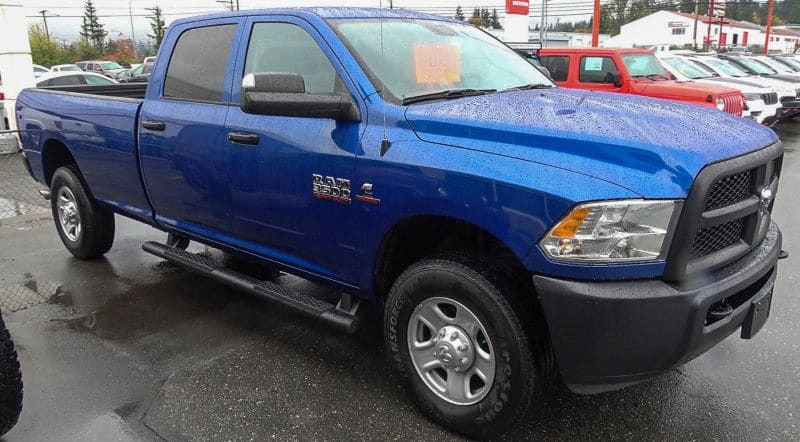 So normally I would be adding a section for our tow vehicle, but this is a special year as we just bought a brand spanking new 2018 Ram 3500. Not much to do with it other than break it in and set up and organized my bed storage. In the past, I’ve made sure the truck was in good mechanical shape with all maintenance up to date, with special attention to tires and brakes. Give it a good clean and wax job and poke my nose everywhere, giving it a detailed inspection, looking for any possible defects or worn parts. As I said before better to fix things now than on the road.